Normally, its just a sleepy, former castle-town, which could be said to be right smack in the middle of nowhere. But each year, during an approximately one-week-long window of opportunity sometime in late April or early May, throngs of enthusiatic visitors, PILGRIMS of a sort, converge on the town of MIHARU ( 三春) in Fukushima Prefecture, from near and far. Excitedly emerging from their cars and tour buses in an immense shopping mall style outdoor parking lot, these crowds stream energetically into pedestrian tunnels which all lead them to what they`ve come for: not a rock concert or the Superbowl ( though the electricity in the air would make you think it was something of the sort)- but a SINGLE TREE- the MIHARU NO TAKI-ZAKURA ( the Miharu Cascading Cherry Tree) in full bloom! And though this might seem odd to some readers (all the fuss over one tree! ), on days when the 1000 year old giant ( 12 meters tall) IS in full bloom, no- one leaves disappointed, no matter matter how far they`ve travelled. It is simply awesome to be in the presence of such a grand and ancient LIVING ORGANISM, which as its moniker expresses, looks not unlike a cascading waterfall, with its countless pink petal fluttering in the breeze. 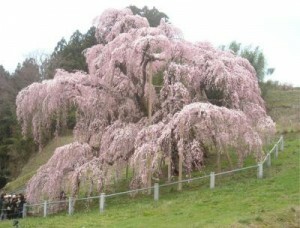 Along with the YAMATAKA- JINDAI-ZAKURA ( 山高神代桜) of Yamanashi Prefecture, and the NE- ODANI- USUZUMI-ZAKURA ( 根尾谷淡墨桜) of Gifu, the Taki Zakura is esteemed as one of the Three Great Cherry Trees ( Nihon San Dai Sakura, 日本三大桜 ), and there are many who feel that it is THE greatest sakura of them all. 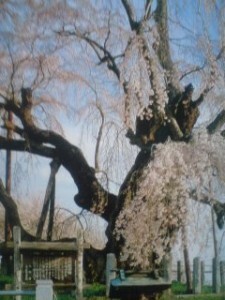 It first rose to national fame way in the mid-19th century, when the Lord of Miharu paid a visit to Kyoto and presented the Emperor at that time, Ko-Kaku Tenno ( 光格天皇) with a painting of great tree. WEB-CAM view of of the tree! 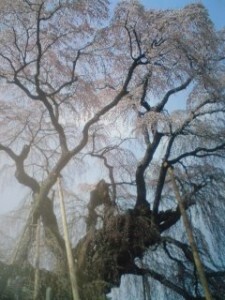 If you go see it in with your own eyes, by slowly circling around the SAKURA at various distances, it is possible to enjoy the myriad forms it takes on as seen from different angles. One thing that does disappoint some visitors ( including myself) is that you cannot actually do HANAMI ( have a sit-down party) under the tree itself ( though this is clearly a rule which is necessary to enforce in order to protect the tree. Exploring by car or on foot will reward you with plenty of rustic pictures of small town Japan. I would also recommend looking into buying some of the crafts for which Miharu is famous: paper-mache figurines, tops, and Tengu masks. If you are planning a trip to Fukushima this weekend. I would recommend catching the fever, and making a pilgrimage to the tree. It takes about three hours to get there from Tsukuba. 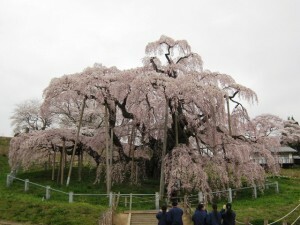 It is Japanese HANAMI and the cult of the Sakura, boiled down to its basic element- the single (AMAZING) tree!